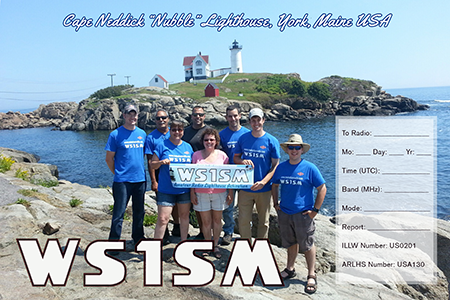 CAPE NEDDICK, ME - On August 16, the WS1SM team activated Cape Neddick "Nubble" Lighthouse for this year's International Lighthouse & Lightship Weekend (ILLW). with a SOTA Beams 40m dipole, and an Elecraft KX3 with random wire. International Lighthouse & Lightship Weekend is an annual radio activity that started 17 years ago in Scotland by members of the Ayr Amateur Radio Group. It evolved from the Scottish Northern Lighthouses Award Weekend into a popular International event, which now sees over 450 lighthouses and lightships participating from over 85 different countries. Cape Neddick Lighthouse had the designator US0201 during the event. 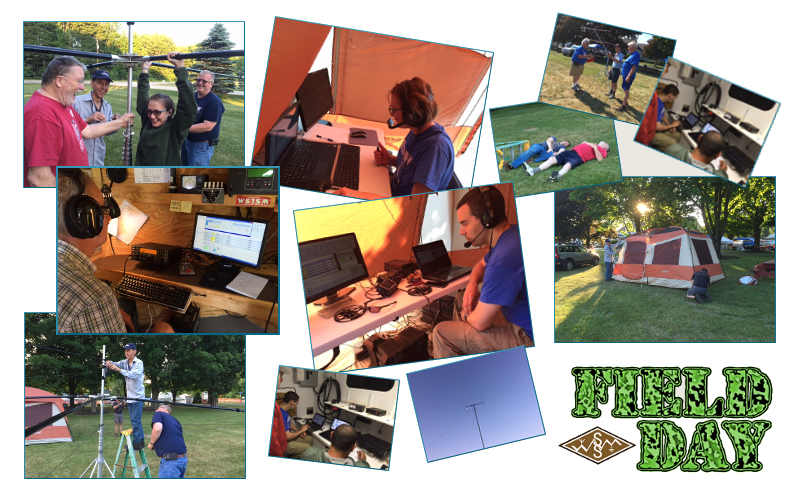 SCARBOROUGH, ME - In late June, the WS1SM team participated in their 7th Field Day from Wassamki Springs Campground, in Scarborough. With over 30 participants and guests, including visitors from Cumberland County EMA, the ARRL, and local public service representatives, the activities were many. On the air, we operated as 3A (which is a club station, on battery power, using 3 transmitters), maintaining a continuous presence on the bands on CW, SSB, and digital. We also had a Get on the Air (GOTA) station operating during most of the event, allowing beginners and new hams to operate HF. Click here to view photos of the event. 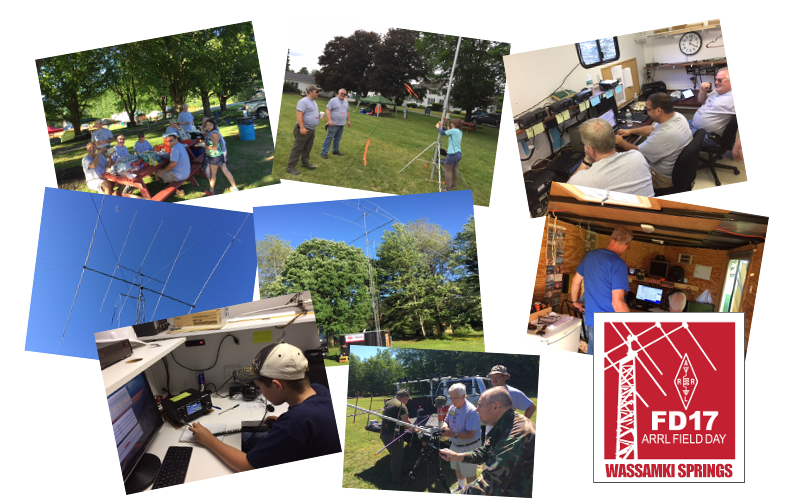 SCARBOROUGH, ME - In late June, the WS1SM team participated in their 6th Field Day from Wassamki Springs Campground, in Scarborough. With over 30 participants and guests, including visitors from the state house, Cumberland County EMA, and local public service representatives, the activities were many. On the air, we operated as 3A (which is a club station, on battery power, using 3 transmitters), maintaining a continuous presence on the bands on CW, SSB, and digital. 2016 was our most successful Field Day to date, and the results, published by the ARRL in December, confirmed this, as we topped Maine overall. We'd like to thank all of those who contributed. 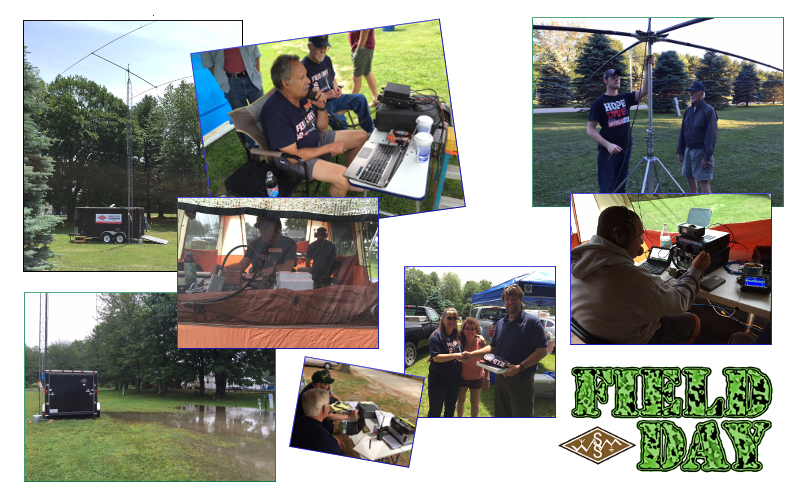 SCARBOROUGH, ME - The Wireless Society of Southern Maine took part in their 5th ARRL Field Day on the weekend of June 27-28, at Wassamki Springs Campground in Scarborough. Operating battery power, the WS1SM team matched their previous QSO record by the 11th hour. Heavy rain began at nightfall and continued throughout the day on Sunday, leaving much of the ground saturated and the CW trailer surrounded by water, but despite the damp and cold, everyone went on with their work, and contributed to our most successful Field Day to date! 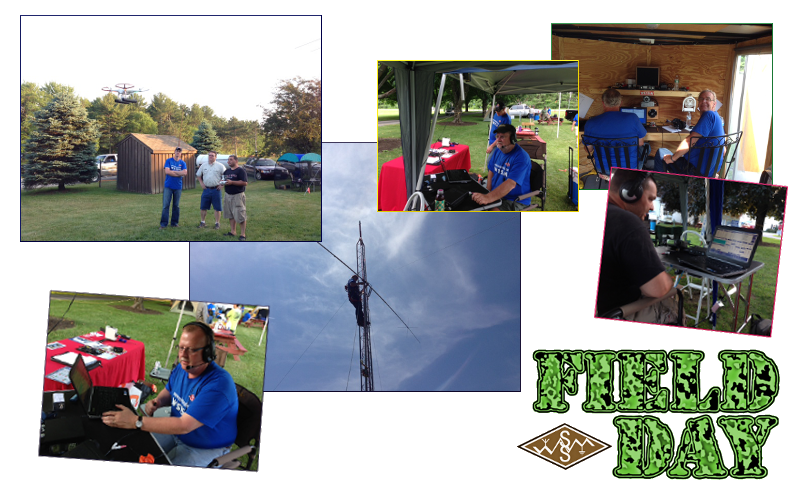 SCARBOROUGH, ME - The Wireless Society of Southern Maine took part in their 4th ARRL Field Day on the weekend of June 28-29, at Wassamki Springs Campground in Scarborough. Operating battery power, the WS1SM team matched their previous QSO record by the 8th hour, amassing more than 650 QSO's on CW alone and another 380 on SSB. Once again, thanks to everyone who contributed to make this our best Field Day to date! 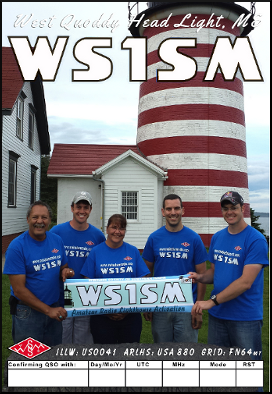 LUBEC, ME - On the weekend of August 16-17, the WS1SM team activated West Quoddy Head Light for this year's International Lighthouse & Lightship Weekend (ILLW). Operating 3 stations simultaneously on mixed HF with battery power, the team made over 200 QSO's, many of which were lighthouse-to-lighthouse contacts. Stations consisted of a Yaesu FT897d with a BuddiPole rotatable dipole, an Icom IC706 MKIIG with a SOTA Beams 40m dipole, and an Icom IC7000 with a fan dipole for 10/15/20m. International Lighthouse & Lightship Weekend is an annual radio activity that started 16 years ago in Scotland by members of the Ayr Amateur Radio Group. It evolved from the Scottish Northern Lighthouses Award Weekend into a popular International event, which now sees over 450 lighthouses and lightships participating from over 85 different countries. West Quoddy Head Light had the designator US0041 during the event. CAMPOBELLO, NB - On Sunday, August 17, members Ryan Michaelson KB1YTR, Thom Watson W1WMG, and Tim Watson KB1HNZ, ventured to New Brunswick's Head Harbor Light Station, to activate their first Canadian light for ILLW. Using call sign VE9/WS1SM, the team setup Ryan's Elecraft KX3 with a random wire antenna for HF, and also used a Kenwood TMD710 to make several contacts on VHF, including a member of the Swallowtail Lighthouse ILLW team on Grand Manan Island. East Quoddy Head Light (Head Harbor Light Station) had the designator CA0047 during the event. BRISTOL, ME - WSSM members participate in the International Lighthouse and Lightship Weekend, which takes place annually each August, as well as other lighthouse activations throughout the summer months. In recent years WS1SM has operated from Pemaquid Point Light (2011), in Bristol, and Wood Island Light (2012), in Biddeford Pool. On August 18th, we returned to Pemaquid Point for this year's ILLW, making over 200 contacts with the help of multiple transmitters, including Steve's (N1EOE) "go box" which was outfitted with a Yaesu FT-897, tuner, and battery pack. We also used Tim's (KB1HNZ) Yaesu FT-857 on battery power, Ryan's (KB1YTR) Elecraft KX-3, and Charlie's (W1CPS) Icom IC-7000. 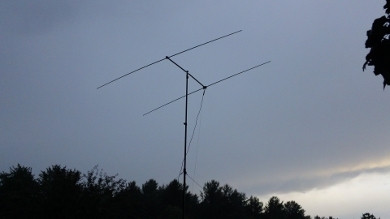 Antennas included a BuddiPole rotatable dipole, a G-Whip end fed zepp, a 40 meter dipole, and a multi-band fan dipole. 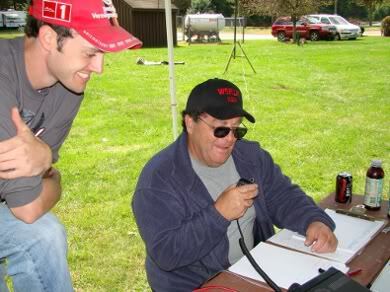 SCARBOROUGH, ME - The Wireless Society of Southern Maine took part in their 3rd ARRL Field Day on the weekend of June 22-23, at Wassamki Springs Campground in Scarborough. Operating battery power, the WS1SM team doubled their previous QSO record by the 6th hour, amassing more than 120 QSO's on CW alone, 300 on 40m SSB, and another 220 on the various other bands, including 15m, 20m, 50 MHz, and 144. Thanks to everyone who contributed to make this our best Field Day yet! BATH, ME - On October 20th, the WSSM team set up a JOTA station during the Boy Scouts Camporee weekend at the Maine Maritime Museum. Operating on battery power, we used a dipole antenna for 40 meters and a BuddiPole rotatable dipole for 15 and 20 meters. The transceiver used was a Yaesu FT-857D. 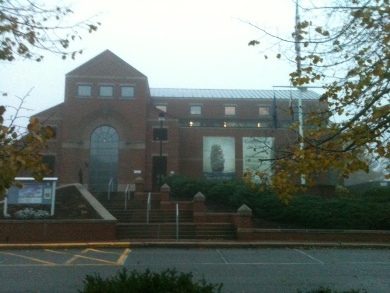 The operating location was inside the museum, overlooking the Kennebec River and the historic Percy and Small Shipyard. It was a lot of fun introducing amateur radio to all the scouts during Jamboree On The Air, but also in taking the time to talk to scouts from other JOTA events around the world. We even had some of our boys talking with scouts in other places, but they were most excited about making contacts with DX stations who were taking part in the DARC German Districts contest. One of the scouts had a QSO with a ham in Luxembourg, and after he set down the mic, asked, “Where’s Luxembourg?” So, besides being an opportunity to learn about the fundamentals of amateur radio, it also prompted some curiosity in geography. 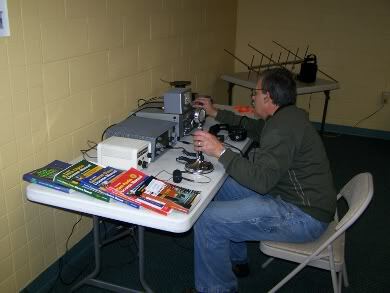 The WS1SM team also demonstrated the techniques involved in radio direction finding. Hiding a small transmitter that bursts a low-power amplified morse code signal, the scouts who participated were able to track it down using triangulation techniques, and a specialized device known as a Vector Finder. Many of the scouts and visitors who took part said that this was the most fun they had all day. Though fun, they also learned about the importance of radio direction finding in aiding search and rescue operations. 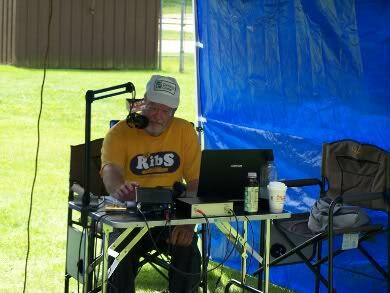 This was our second year participating in Jamboree On The Air, and we’re already looking forward to next year! BIDDEFORD POOL, ME - WSSM members Thom Watson W1WMG, Sam Webber N1WIG, Dave Wood KB1FGF, Rory McEwen KB1PLY, and Tim Watson KB1HNZ, activated Wood Island Lighthouse #US0141 for the International Lighthouse and Lightship Weekend, on Sunday, August 19th. The island also qualified as IOTA #NA137 and this was first time Wood Island was activated as US Islands ME103. The team made 97 QSO's and contacted several other lighthouses throughout the country and around the world. The station operated on 100% battery power and consisted of a Yaesu FT857D, an Icom IC7000, a 40 meter dipole, and a BuddiPole rotatable dipole. 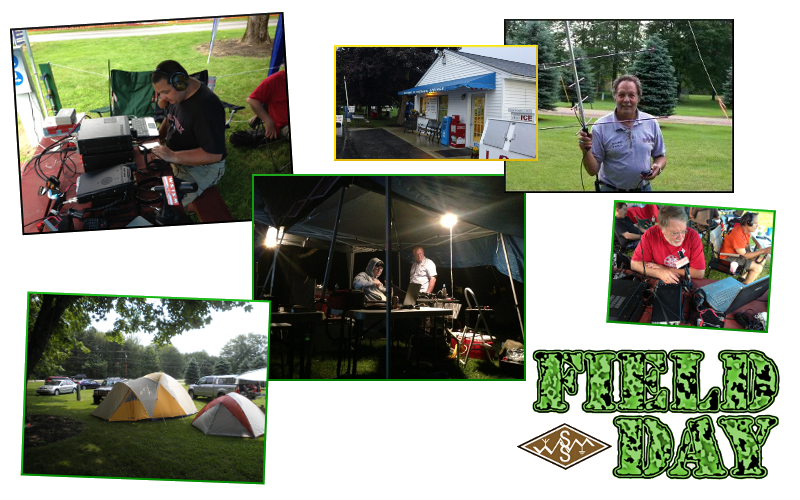 SCARBOROUGH, ME - The Wireless Society of Southern Maine took part in their 2nd ARRL Field Day on the weekend of June 23-24th, at Wassamki Springs Campground in Scarborough. 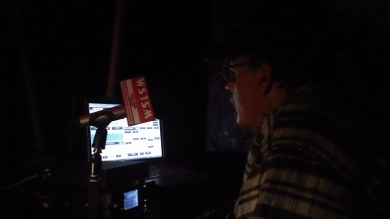 Operating battery power, the WS1SM team equaled last years QSO record, despite having to shut down for nearly two hours Saturday night because of lightning storms. 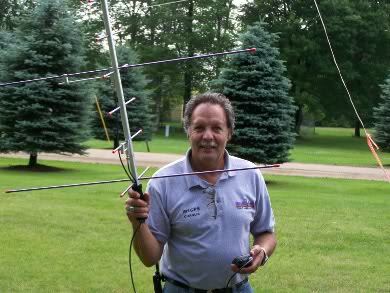 Most of the contacts were made on the 80, 40, and 20 meter bands using a variety of portable antennas. 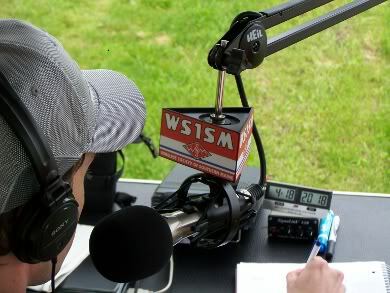 GORHAM, ME - The Wireless Society of Southern Maine took part in the Gorham Founder's Festival for the second consecutive year during Memorial Day weekend, from May 25th - 26th. 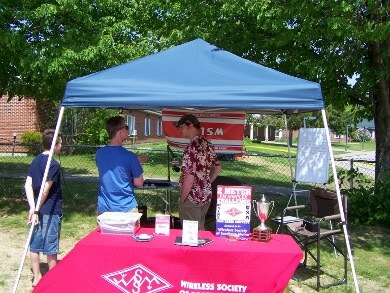 Members set up an information booth and were on hand to answer questions about amateur radio. They also operated the club station, WS1SM, as a special event to help celebrate the anniversary of Gorham's founding. The event was a big success. Members talked to many current and perspective hams, and were able to demonstrate the capabilities of amateur radio to town officials and the public. The special event station was operated using battery power and a BuddiPole rotatable dipole antenna. LEWISTON, ME - The Wireless Society of Southern Maine set up a table display and were on hand to answer questions at this year's ARRL Maine State Convention, held at the Ramada Inn & Convention Center in Lewiston, on March 23rd & 24th. We were glad to meet many hams from across the state who stopped by, and sign up some new members! Sam Webber N1WIG, Paul Cereste K1CGZ, Frank Allen KA1QW, and Thom Watson W1WMG. 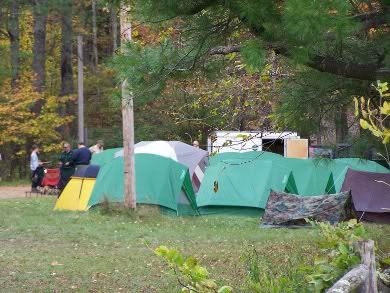 NORTH BELGRADE, ME - On October 15th, the WSSM team set up a JOTA station during the Boy Scouts Camporee weekend at Camp Bomazeen. 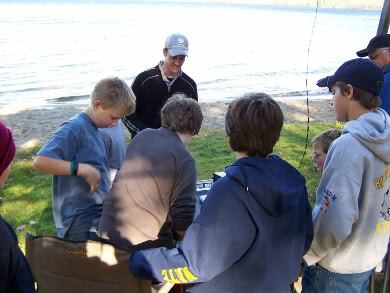 Amateur radio was part of the activities that the scouts could take part in, and many had an opportunity to get on the air and communicate with other hams and scouts around the world. Several groups stopped by our station throughout the day, and many said they enjoyed their first ham radio experience. 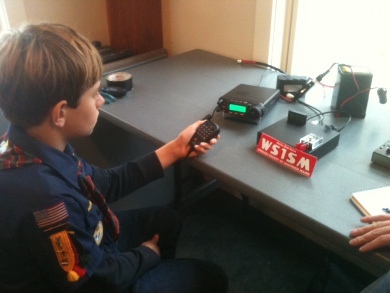 Some of the scouts were trying for their radio merit badges, and others expressed interest in getting a ham radio license of their own. Thanks to Assistant Scoutmaster, Brandon Wilkins, of Troop 648 in Brunswick, for inviting us. SCARBOROUGH, ME - We took part in our first Field Day on the weekend of June 26-27, at the Wassamki Springs Campground, in Scarborough. Choosing not to begin setting up until 2:00 PM on Saturday, the club station, WS1SM, operated for 27 consecutive hours. On hand were many club members, as well as hams and visitors from all over. The main station was an Icom 706MKIIG, using battery power, and several dipole antennas. We also set up a Yaesu FT-817 to operate VHF / UHF, using 5 watts and a BuddiPole (rotatable dipole). 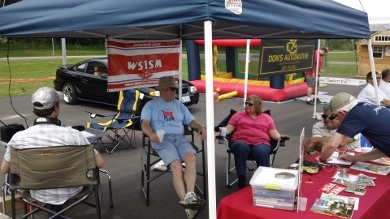 GORHAM, ME - The Wireless Society of Southern Maine took part in the Gorham Founder's Festival during the Memorial Day weekend, from May 27-30. 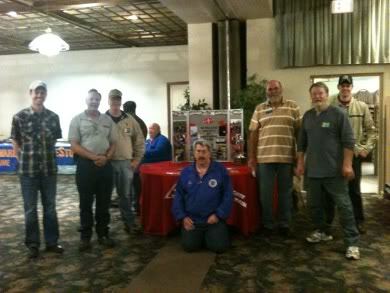 Members set up a table display and were on hand to answer questions about amateur radio. They also operated the club station, WS1SM as a special event to help celebrate the 275th anniversary of the founding of Gorham, Maine. 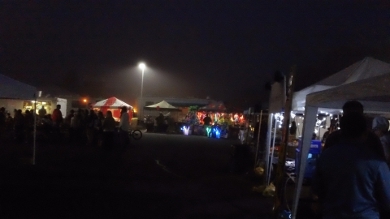 The event was a success for the club, as they signed up new members, talked to many perspective hams, and demonstrated to town officials and the public, the capabilities of amateur radio. 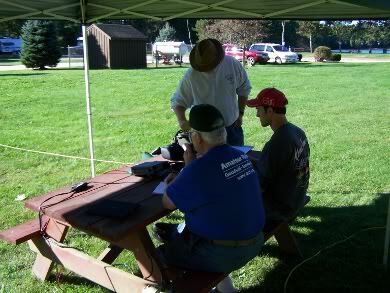 Members operating the special event station made over 200 contacts, using several different modes including SSB, CW, and digital. Tim, KB1HNZ, works a pileup on 20 meters Saturday afternoon. 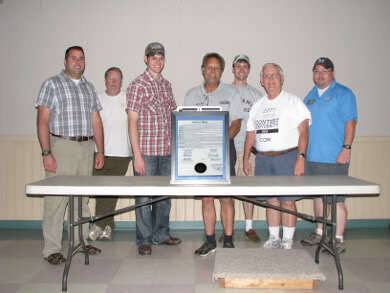 SCARBOROUGH, ME - Members of the Wireless Society of Southern Maine pose with the official proclamation which was signed by the Maine State Legislature, recognizing April 18th, 2011 as World Amateur Radio Day. Tony Bessey, representing the Maine Section of the American Radio Relay League, was kind enough to bring the document to our monthly meeting on June 9th. From left to right: Jason Andrews (KB1UXB), Frank Allen (WA1PLD), Thom Watson (W1WMG), Charlie Shepard (W1CPS), Tim Watson (KB1HNZ), Frank Krizan (KR1ZAN), and Tony Bessey (N1AJB). GORHAM, ME - Kid's Day a success! The Wireless Society of Southern Maine kicked off the New Year with the Kid's Day Operating Event, held at the Gorham Recreation Department. 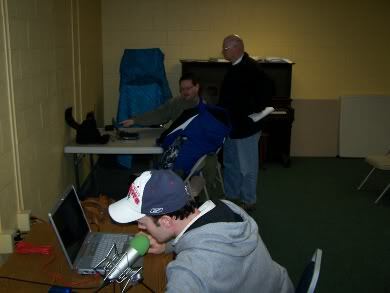 The club set up several stations, including two HF radios, a VHF radio, a D-STAR setup, and a Morse Code Practice area. Several youths from the area stopped in to see what it was all about, and a few made contacts on the air. Each participant took home a special certificate and got to fill out an official WSSM QSL card to mail to the station they contacted. 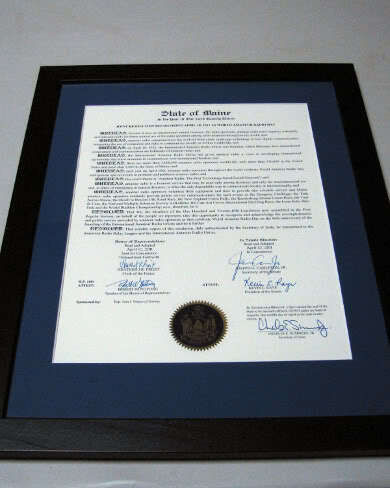 The Wireless Society of Southern Maine applied for a call sign on July 29th, 2010, and was systematically assigned the call KB1UPU on August 2nd. About a week later, the club applied for a vanity call, and on August 24th, was granted WS1SM. Good news! Although the call sign was technically official when it was posted on the FCC's website on August 24th, the paper license arrived in the mail on August 30th for WS1SM. Plans are to activate the station for our next meeting at Wasamki Springs Campground, and make a few contacts with the new call. 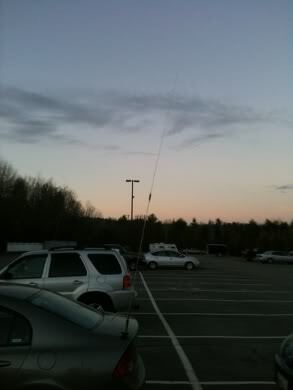 SCARBOROUGH, ME - On Saturday, September 18, we made our first contact with the club call sign, WS1SM. Frank (KR1ZAN) had the honors. At 1351 UTC, on the 40 meter band, he worked Ron, W4CA, who was operating a special event called the "Blue Ridge Bonanza." Ron was located at a place called Rockfish Gap, at mile post zero, on the Blue Ridge Parkway in Virginia. By the end of the day, we were able to contact seven more Blue Ridge Bonanza stations, which qualified us for a certificate from the Roanoke Valley Amateur Radio Club. During the day, we also had fun contacting participants in the South Carolina QSO Party, the Washington "Salmon Run," and made several DX contacts using an Icom 706MKIIG, and our 20, 40, and 80 meter dipoles - one of which was built by members at the most recent meeting. We operated from 8AM until 7PM, from the front lawn of the Wassamki Springs Campground in Scarborough. (Pictures follow).